Ron Arad (1951) is among the most respected and influential designers working today, he is celebrated for his fluid, curvaceous style, crafting deceptively simple, highly skilled pieces from materials such as aluminium, bronze and steel. Defying easy categorisation, Arad's work consistently reinvents the everyday object, transforming it into something daring, witty and provocative. Bookshelves wind their way up walls, tables curve up corners, chairs unravel like ribbon, all retaining their essential function while questioning their perceived limitations. These playful but daring designs of everyday objects is also demonstrated in Ron's earrings which he based on his light 'Hot Ingo'. The polyamide spiral wrapped around a long rod has an ever-changing diameter. 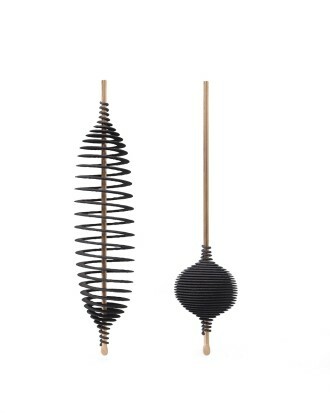 Either recoiling into a tight small ball or concertinaing out to span the length of the rod, these earrings can be distorted into a series of variations depending on individual style and taste. Born in Tel-Aviv in 1951, Arad moved to London in 1973. Completing his training at the Architectural Association in 1979, he established his own design practice 'One-off' in 1981, fusing together ready-made and partially ready-made pieces to create works such as the now iconic Rover Chair. A second studio 'Ron Arad Associates' opened in Camden in 1989, incorporating One-Off in 1994 and still operates from the same premises today. Recent museum shows include the critically acclaimed No Discipline tour which opened at the Centre Pompidou in Paris and travelled to New York's MOMA in August 2010. A third outing is planned for the Stedelijk Museum in Amsterdam in autumn 2011. A distinct and hugely popular survey 'Restless' opened at the Barbican Centre in London in February 2010. Arad's work features in private and public collections worldwide, including the Metropolitan Museum of Art, New York and the Victoria and Albert Museum, London. A culmination of artist Ron Arad's most recent work in jewellery with Louisa Guinness Gallery. In the catalogue we focus on three separate projects; Rocks, Naja and Hot Ingo. Please click here to view the eCatalogue.